Located in the subterranean Sainsbury Galleries, the British Museum's Africa section, the Tree of Life is a sculpture made in Mozambique from decommissioned weapons. 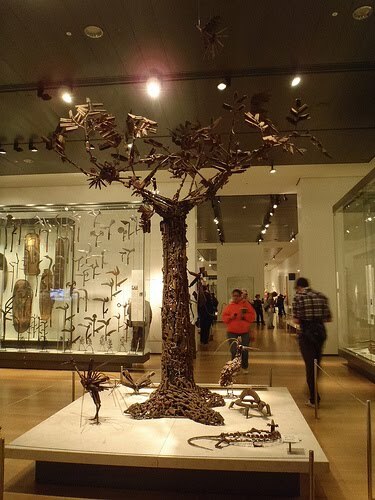 The creation of Mozambican artists Cristovao Canhavato (Kester), Hilario Nhatugueja, Fiel dos Santos and Adelino Serafim Maté, the sculpture was made as part of the Transforming Arms into Tools project, which aims to eliminate the threat presented by the hidden weapons. It highlights the millions of weapons which arrived in Mozambique during the country's civil war, many of which remain hidden or buried in the bush. The project encourages Mozambicans to hand them over in exchange for more useful everyday items like ploughs, bicycles and sewing machines. We are told that, in one case, a whole village gave up its weapons in exchange for a tractor. The Tree of Life is in Room 25, and is free to visit. For more, see here. 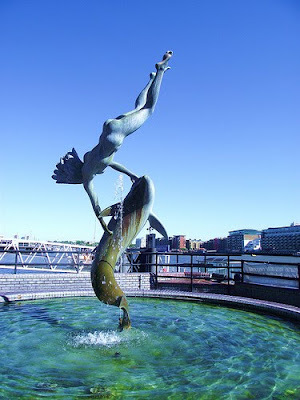 Situated on the north bank of the Thames near Tower Bridge, 'Girl with a Dolphin' was created by artist David Wynne in 1973. The statue sits on the waterfront outside the Tower hotel. There is a brother statue, called Boy with a Dolphin, at the Chelsea School of Art. Like many of his sculptures, this one is, apparently, noted for its depiction of movement, giving the illusion of the figures flying unsupported. For a little more, head over to Shady Old Lady here. Serving the people of Chinatown with reading material which is often hard to access, the Westminster Chinese Library, part of Charing Cross Library, houses one of the largest collections of Chinese materials in a public library in the UK. Thousands of Chinese-speaking people come from far and wide to use the library, which offers around 50,000 Chinese language books for loan and reference, as well as mMusic cassettes, CDs, and videos. A team of four Chinese speaking staff is on hand to help visitors, and anyone can join as long as they have proof of a permanent address somewhere in the UK. The library is open seven days a week and also has a full collection of English language books. 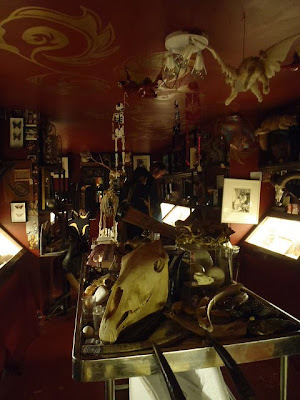 In the basement of the Last Tuesday Society shop at 11 Mare Street, E8, is Viktor Wynd's Little Shop of Horrors, a collection of natural and supernatural objects, assembled on the basis of their aesthetic or historical appeal. It is, we are told, an attempt to recreate the atmosphere of the Kunstkamera, the Russian Museum of Peter the Great, dedicated to the exhibition of "natural and human curiosities and rarities". Within, you can find anything from winged cats to shrunken heads, two headed teddy bears, human skulls, mummified penises, preserved trigger fingers, medical instruments and naughty books. Founded by Thomas Rule in 1798, Rules, on Maiden Lane in Covent Garden, has a claim to the title of London's oldest restaurant. 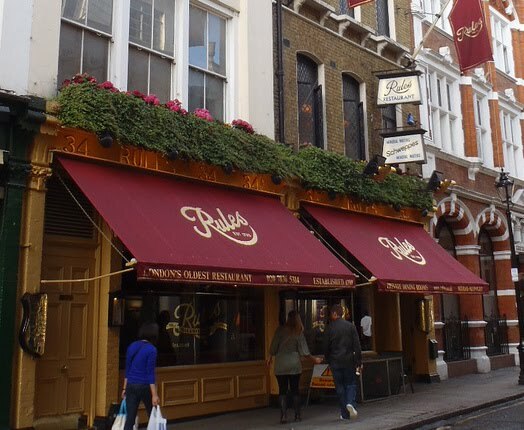 The story goes that Rule had made a promise to his family that he would say goodbye to his wayward past and settle down, and opened the restaurant as an Oyster Bar, serving British Cuisine alongside. The restaurant has only passed through three families during its history, famously changing hands just before the First World War when a Charles Rule decided to move to Paris and swapped restaurants with Tom Bell, a British chap who owned a Parisian restaurant. It remained in the Bell family until his daughter sold it to John Mayhew, the current owner, in 1984. During its history, Rules has entertained an array of famous names, including Charles Dickens, John Galsworthy, H.G. Wells, Henry Irving, Laurence Olivier and probably Evelyn Waugh. The fantastic John Betjeman apparently described the ground floor interior as "unique and irreplaceable, and part of literary and theatrical London", and helped save it from demolition in the 1970s. Your author has been in, and had a few drinks upstairs in the pleasant cocktail bar (but more about that another day) but has sadly never eaten. Perhaps one day someone will treat him. Serving nautical visitors to Shaftesbury Avenue for probably around 120 years, Arthur Beale is a traditional chandlers selling rope, fittings, flags and other bits and bobs for boats. It's an odd find in an area where you wouldn't really expect to find such things, but when you think about it this is a hotbed for these sorts of historic independent businesses. James Smith Umbrellas is in the same area, as is the Punjab restaurant. Your author has no idea why this is, but it may be a legacy of the Metropolitan Street Improvements Act of 1877, under which Shaftesbury Avenue had been built, which allowed freehold interests to be bought after a period of time. Unlike in other areas, where billionaire aristocratic families raise rents as high as possible, and often price independent traders out of business in hard times, here many premises can be owned outright by their occupants, reducing overheads and allowing businesses to last in the face of rent rises elsewhere. 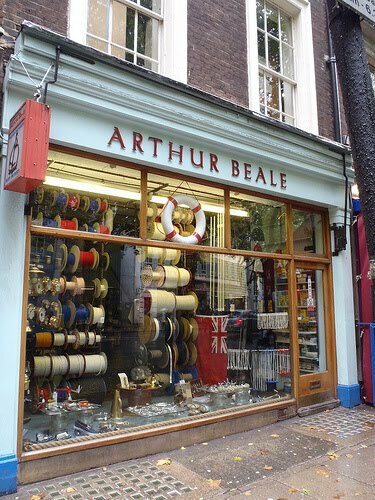 Arthur Beale is at 194 Shaftesbury Avenue and is open Monday - Saturday. It has no website, but for more, you could try this interview. In 1998, a decision was made to expand its remit so that it is now a national memorial of all firefighters in Great Britain who have lost their lives during active service. 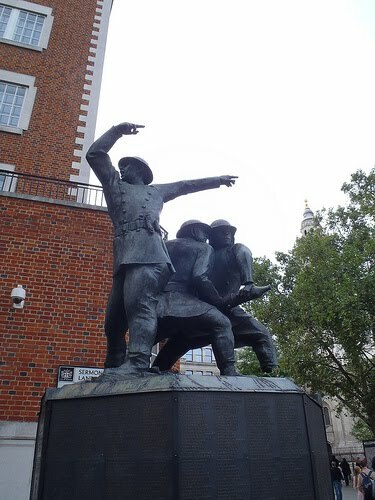 In 2003 the Memorial was raised onto a new base to allow the additional names of those lost in peacetime were inscribed in bronze on it, then it was re-dedicated to coincide with the Service of Remembrance in Sept 2003. 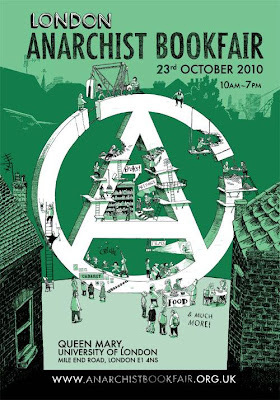 Even Anarchists need to buy their books from somewhere, and today marks the 28th London Anarchist Bookfair, at Queen Mary College in Mile End. At last year’s bookfair there were apparently around 100 stalls and 50 meetings and lectures from different anarchist groups. There was also an all day cabaret starring assorted ranters, poets, singers and comics, and film showings. They tell us we can expect the same this year. Your author can be rather patronising about anarchists, often using catch-all phrases like, "that's so sweet, but it will never ever work", but it is always interesting to hear from people who think differently to you, and they have gone to a lot of effort. 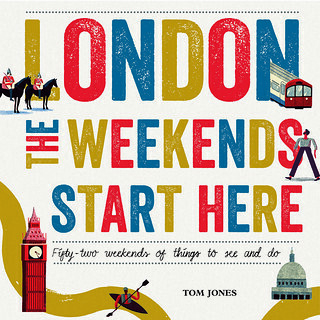 Your author sometimes absolutely amazes himself with how little he actually knows about London. 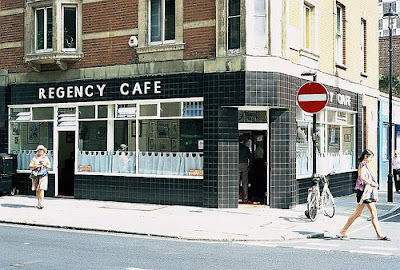 The Regency Cafe, established in 1946 in Pimlico, is a prime example. It has been staring him in the face for years, walking past as he has on countless occasions, but the first time he ever went was yesterday, and he found one of his best friends sat just inside the door. 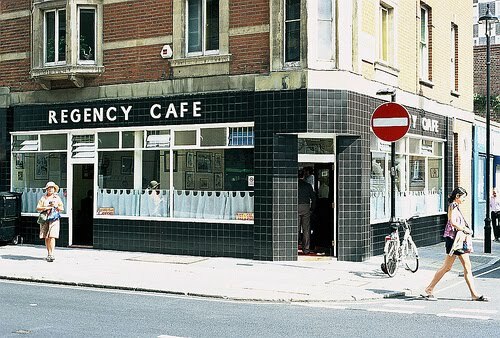 Populated largely by lunching Civil Servants, and the odd Channel 4 bod, the Regency would probably be described as a 'design classic' in an art magazine, or as a 'quintessential greasy spoon' by a food magazine, but it doesn't appear they are that worried about labels. What they do is good honest British staples, quickly and at very reasonable prices. It's so iconic in its design that it has been chosen to feature in films and TV, memorably in a scene in 2004's Layer Cake. Most notable of all, however, is the friendly lady serving at the tills who can vary her voice from fantastically loud to a sedate chat in the bat of an eyelid. It has to be seen to be believed. For more, and some fantastic pictures, see here. 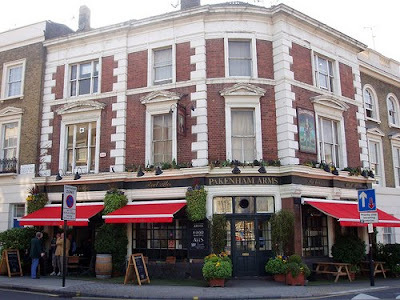 Though your author hasn't been in for a little while, the Pakenham Arms, beside Mount Pleasant Royal Mail Sorting Office in Clerkenwell, never disappoints. A great spot for watching the football, it attracts a mixed crowd of posties, locals and often students from the halls of residence in the surrounding area. In a time when we didn't have such liberal licensing laws it was known for its longer opening hours, fixed to suit the flexible shift patterns of those working at Mount Pleasant, but it is still a great pub, sourcing much of its produce in the UK and striving to have five ales on tap all the time. After yesterday, your author needs a rest, so where better to catch a few autumnal rays of sun than the Dalston Eastern Curve Garden. Created by architectural practice EXZYT on a space previously occupied by a piece of railway track, it's a welcome oasis in a fairly urban area. 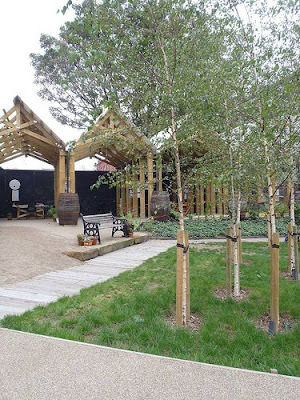 The Dalston Eastern Curve Garden is open from 11am – dusk from Monday to Sunday and entrance is free. 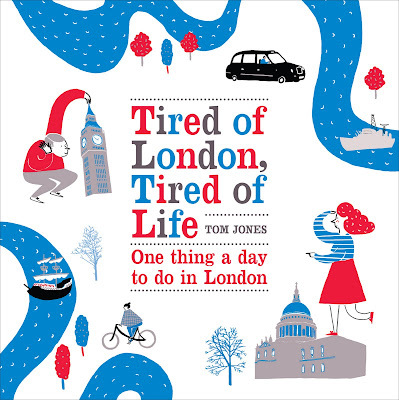 Come to Tired of London, Tired of Life's second birthday. 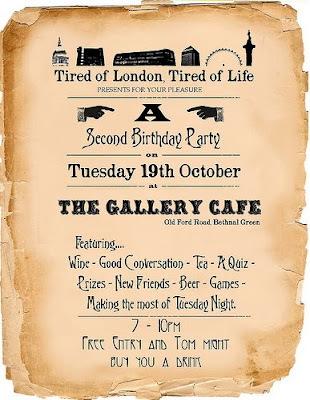 As you have probably noticed from all the relentless plugging, there is only really one thing that your author wants you to do in London tonight, and that is attend this website's second birthday party. 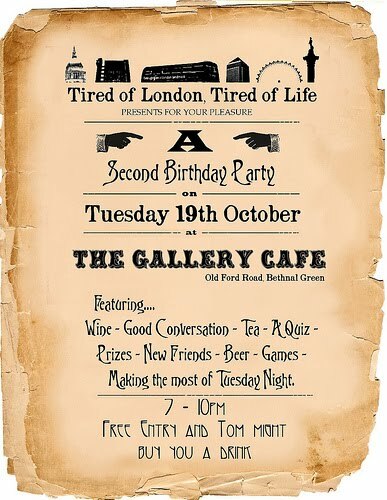 It all kicks off tonight from 7pm until 10pm at the Gallery Cafe in Bethnal Green and there will be a London quiz, accordion music and song from South London's Alexandra Carter, conversation menus to help break the ice with nice people, and the usual fantastically-stocked bar and cafe menu at the Gallery. It is the first time your author has ever held an event for this site so it would be really lovely to meet some new people, and to find out what they think of it all. So don't be put off by the cold weather when you finally emerge from work, hot-foot it to Bethnal Green where a warm welcome awaits. Your author might even buy you a drink. For the full invitation, see here. For centuries country folk have noticed a period of better weather around St Luke's Day, the 18th October. This became known as 'St Lukes Little Summer'. 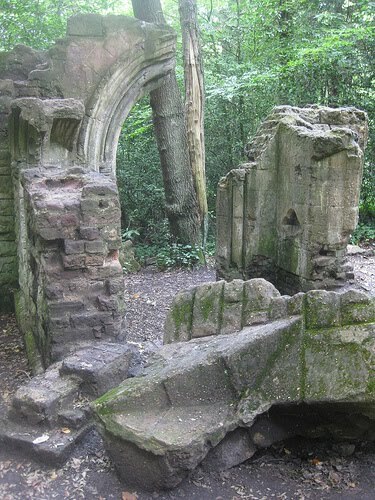 They might be a day or so out but the forecast looks good for later, so why not take the opportunity to have a wander around Sydenham Hill Wood, a nine hectare area of ancient woodland in South London. The wood is the biggest remaining tract of the old Great North Wood, which once stretched from Deptford to Selhurst. Whilst its size was somewhat reduced with the relocation of the Crystal Palace to South London, and the laying of the tracks of the Crystal Palace and South London Junction Railway from Nunhead to the Palace, it outlived both the Crystal Palace, which burned down in 1936, and the railway, which closed in 1954. In 1982, the London Wildlife Trust took over and continue to manage it. As readers might imagine, wildlife abounds, but it is also interesting for the disused railway bed and tunnel which run through it, and the folly pictured above. It's a perfect place to get lost on St Luke's Little Summer. Bit of a Sunday post, this one. Apologies but your author is spending most of his time worrying about this silly party thing on Tuesday, to which you are all invited. 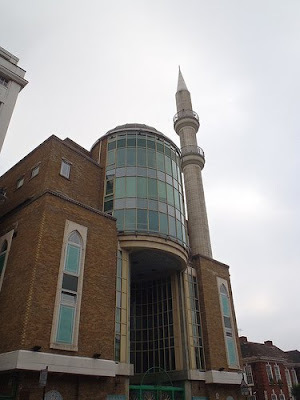 However, the Suleymaniye Mosque, on Kingsland High Street, is an imposing structure and is certainly worth a mention. A Turkish Mosque, which shares its name with the second largest mosque in Istanbul, the site was purchased in 1994, and by 1998 it had begun to operate. In 1999, the Süleymaniye Mosque and Cultural Center was officially opened. Designed by Architect Osman Sahan to reflect the Ottoman style, it sits along with the Aziziye Mosque at the heart of East London's Turkish Community. Kingsland Waste Market, on Kingsland High Street in Hackney, is a Saturday Market which operates from roughly 7.30am to 6pm. Supposedly selling a mixture of tools, car and bike accessories, nearly new clothing and books, in reality it sells almost anything you can fit in a box van, as well as a range of other wares including fruit and veg. 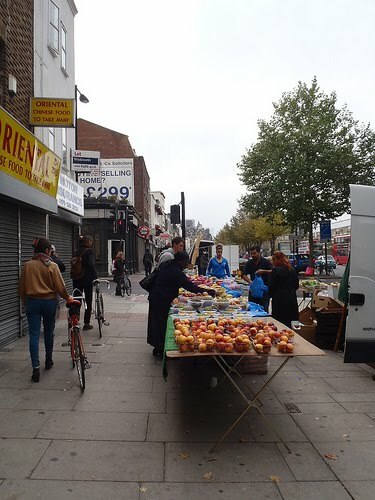 The market is the subject of a chapter in Iain Sinclair's 'Hackney, That Rose Red Empire', in which he charts its relative fall and rise through the words of Norman Palmer, a trader there. It's an interesting place to visit but it can be hard to find much worth buying, especially later in the day. It will probably be swallowed up by the farmer's market hordes eventually, should they tire or Broadway Market. 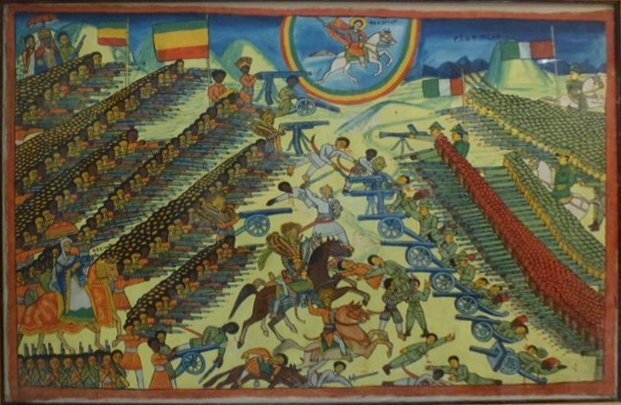 Painted by an unknown artist in the 1940s, the Ethiopian painting of the Battle of Adwa, fought between Ethiopia and Italy on 2 March 1896, is a particular highlight of any visit to the British Museum for your author. In it, Ethiopian forces fight to victory over the better-equipped Italians force, backed by Emperor Menelik II and his wife Empress Taytu. Overhead, St George, the Ethiopian patron saint, looks on. Without knowledge of the complex geo-political factors that were in play, which your author cannot recall from GCSE history, it's not worth taking sides, but it is certainly interesting to see such a battle painted from a victorious African perspective, given such a large proportion of the continent was under colonial rule at the time. For more background, and a much better picture, see here. Charbonnel et Walker have been selling fine handmade chocolates since 1875. Formed from an alliance between a Mrs Walker and a Madame Charbonnel, who had previously worked with the Maison Boissier chocolate house in Paris, the original shop was at 173 New Bond Street in Mayfair. 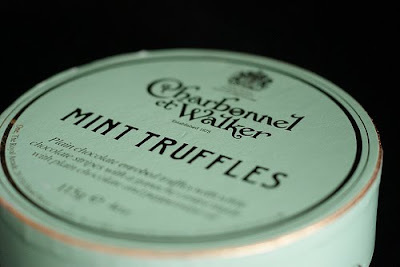 Whilst the flagship store has since moved to the Royal Arcade on Old Bond Street, the chocolates are still the same, and are even a favourite of the Queen, who has endorsed them with the Royal Warrant. Given all the above, readers will not be surprised to hear that they're jolly expensive, but might be worth a try for a special occasion or something. They are very nice. Former home of the 'Governor of Duck Island', a post created by Charles II, Duck Island is now the site of the headquarters of the London Historic Parks and Gardens Trust. The area has been home to various breeds of bird since 1612, when James I began converting a swampy area beside his palaces into a formal garden. Though an earlier building existed on the island, the present Duck Island Cottage, which is home to the Trust, was built between September 1840 and April 1841 and became the residence of the birdkeeper by 1870. However, by the death of the veteran Bird Keeper, Thomas Hinton, who lived there for more than 50 years until 1953, it was in a state of disrepair, not least due to air raid damage from 1940, and considered unfit for human habitation. Having been saved from demolition, in 1959 it was remodelled and extended and became home to two more park keepers who lived there until 1980. 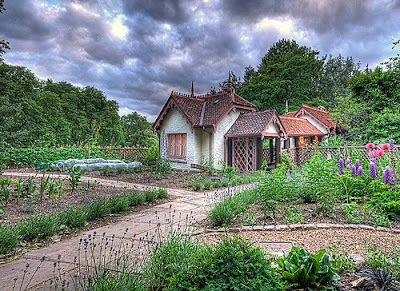 In 1982 it was fully restored, and after a brief period as an office for the Bird Keeper and a store for confiscated bicycles, it finally became the headquarters of the London Historic Parks and Gardens Trust in 1994. Your author doesn't make it to Dalston, the land of haircuts and fixed-wheel bikes, often enough, but he had a wander over last Saturday and managed finally to have a proper look at the Dalston Peace Mural. Designed by Ray Walker and painted by Mike Jones and Anna Walker, the mural supposedly depicts the 1983 Dalston Peace Carnival, though with considerable embellishment and artistic licence. 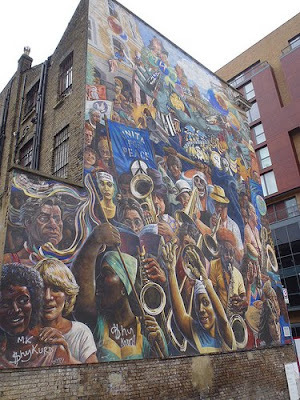 The mural was funded by the GLC and Hackney Council, and unveiled in 1984 by Tony Banks MP, who was instrumental in approving the funding as part of the GLC’s ‘Peace Year’ in 1983. Whilst Banks is sadly no longer with us, the mural is still as vibrant as ever, and can be easily spotted by anyone wandering down Dalston Lane. 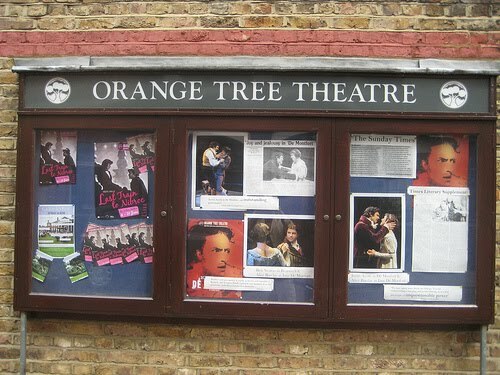 Richmond's 172 seat Orange Tree Theatre is the only permanent theatre in the round in London, meaning the audience surrounds the stage area on all sides. The theatre first began in late December 1971, in the upstairs room of the Orange Tree pub in Richmond, and the current, purpose-built Orange Tree Theatre opened in February 1991, in an old school, across the road from the pub. 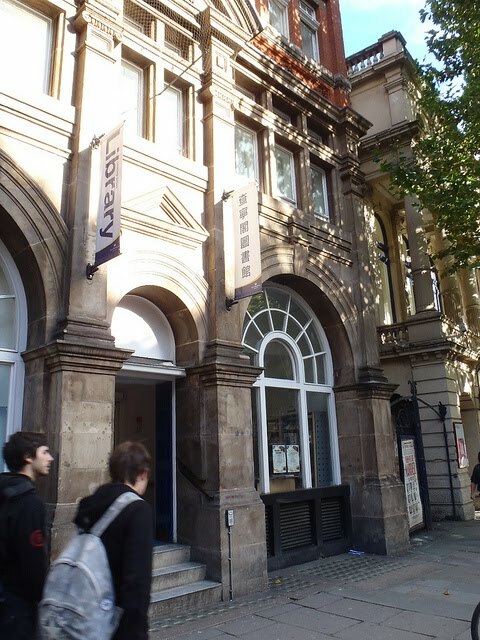 Today, the theatre is a registered charity, and claims that its schools work has expanded to cover 20,000 participants every year. As part of the annual Heath Heritage Festival, this afternoon sees the annual Hampstead Heath Conker competition, with knock out rounds for five groups – the under fives, 5-8 years, 8-12 years, 13-16 years and adults. The winner of each final will receive a trophy. Alongside this, there will be stalls from the National Trust, RSPB and volunteer group Heath Hands, and a chance to do some felt-making, some medieval archery, battle in a tug-of-war and even do some welly wanging. Your author will sadly have to miss it as he is recovering from an intense conker competition last night. It all takes place in the vicinity of the Parliament Hill Bandstand today from 11am until 4pm. 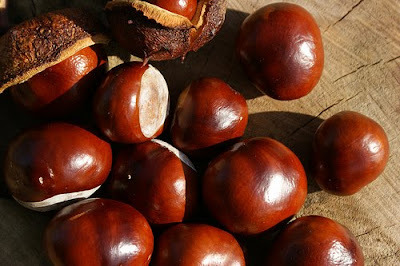 The conker competition is at 3pm, the tug of war at 1.30pm and the welly wanging from 11am until 1pm. Thomas Becket was born in Cheapside in the 12th century, and rose to become Archbishop of Canterbury from 1162 until he was brutally murdered in 1170 by three knights, following a dispute with the nobility and elements of the Norman royal family. Becket was subsequently canonised by Pope Alexander and is venerated as a saint and martyr in the Catholic and Anglican Churches. A sculpture in the gardens beside St Paul's cathedral captures and freezes the final moments of Thomas Becket, as he was murdered at Canterbury in 1170. 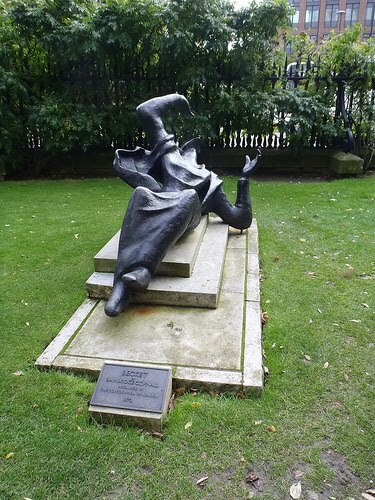 The sculpture was created by Edward Bainbridge Copnall, and acquired by the Corporation of London in 1973. For more on Becket see here and for more on Copnall see here. 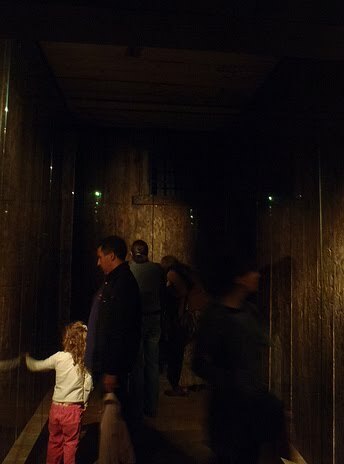 At the beginning of the Museum of London's new downstairs galleries, visitors have an opportunity to experience a prison cell which was once part of the Wellclose Square prison, and served as a temporary home to those serving time for unpaid debts. It is thought the cell dates from around 1750, and was part of the small courthouse and house of correction in Newgate, just to the east of the Tower of London. It is quite atmospheric, with low light and the noise of trickling water and rats coming from somewhere nearby. 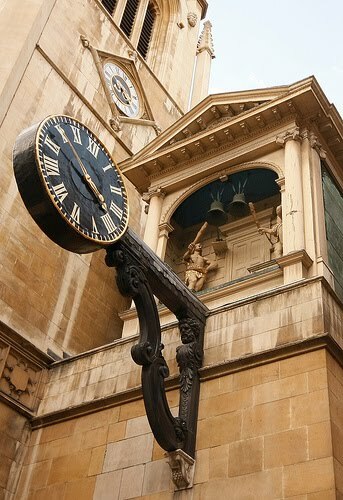 On the front of St Dunstans in the West, on Fleet Street, is an interesting clock, with two mannequins who strike the hours and quarters with clubs, and turn their heads. It is thought that the figures might represent Gog and Magog, two mythological giants who are supposedly the guardians of London. The clock itself dates from 1671, and was famously the first public clock in London to have a minute hand There are numerous literary references to the clock, including in Tom Brown’s Schooldays, the Vicar of Wakefield and a poem by William Cowper. 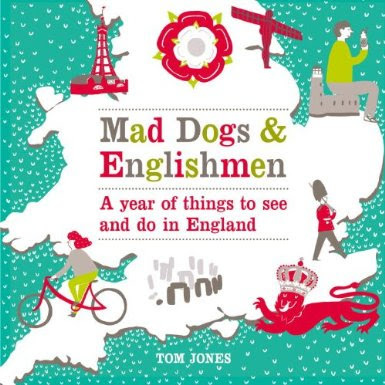 According to mythology Gog and Magog, who also feature in both the Book of Genesis and the Koran, are the guardians of the City of London, and this is why they have been a traditional part of the Lord Mayor's Show since at least 1554. 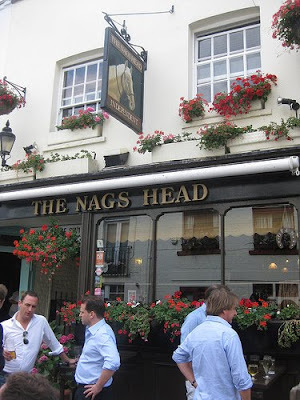 The Nags Head, on quiet and easily-missed Kinnerton Street in Knightsbridge, is a fiercely independent little pub overflowing with character. Brimful of locally relevant curios and pub tat, with a small front bar and an even smaller back bar, what it lacks in size - as so often in pubs - it makes up for in character. When your author has visited, he has never encountered the infamous landlord, Kevin Moran, who is known to tell customers off for using their mobile phones (which are banned) and not hanging up their coats properly, but it is evident that the man knows how to run a decent pub, so he is to be commended. For more, why not see fancyapint.com, who have awarded it five pints out of five. 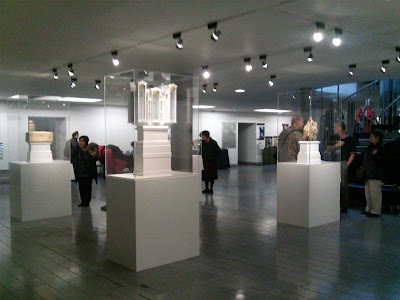 The British Museum's Paul Hamlyn Library is a collection of 50,000 books and journals, aimed to allow visitors to find out more information about the Museum's collection, and the various cultures represented in the main collections. 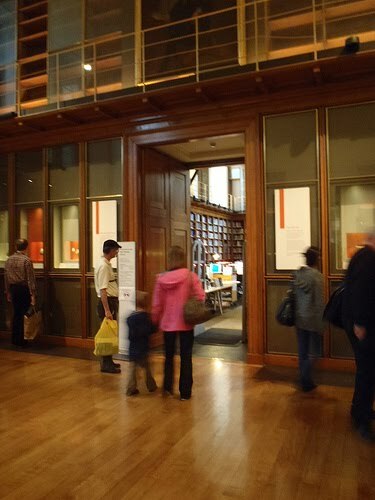 Whilst it's current position is not quite as exciting as the Main British Library Reading Room once used by Marx, Lenin, Gandhi, Kipling and George Orwell, the current space in which it operates, just off Room 2 in the Museum, was home to an earlier library where Robert Browning, Charles Dickens and Charles Darwin conducted their studies. The library operates as a purely reference library, and books are not available on loan. 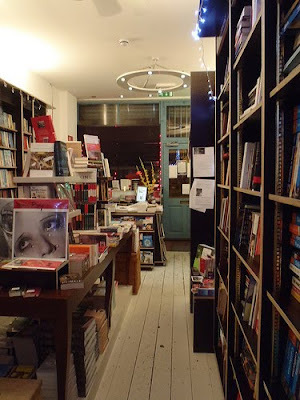 They are, however, available to everyone to read within the room, and for photocopying, during opening hours. 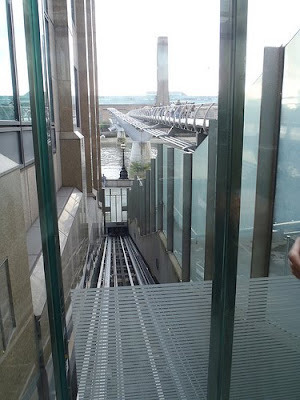 Located at the St Paul's end of the Millennium Bridge is a small section of 'railway' on which sits a lift which can transport passengers from the Paul's Walk along the riverside, to Peter's Hill where the walkway continues to the Cathedral. Manufactured by Maspero Elevatori, in Italy, and opened in 2003, and can carry a maximum of four passengers in its small cubicle, enclosed by glass panels with glass doors at each end. The railway is powered by electric traction, has a speed of 0.5 metres per second and a capacity of 700kg. It's technically just an 'incline lift', and it can only barely be described as a funicular railway. However, it is open to the public, and is free, and it ticks another box in terms of London having everything you could want. Whilst it has been known to break down fairly often, it was working when your author visited yesterday, and has the added bonus of being unaffected by tube strikes. This afternoon, as they do on the first Sunday of every October, the Original Pearly Kings and Queens Association celebrate their annual Harvest Festival at St-Martin-in-the-Fields. 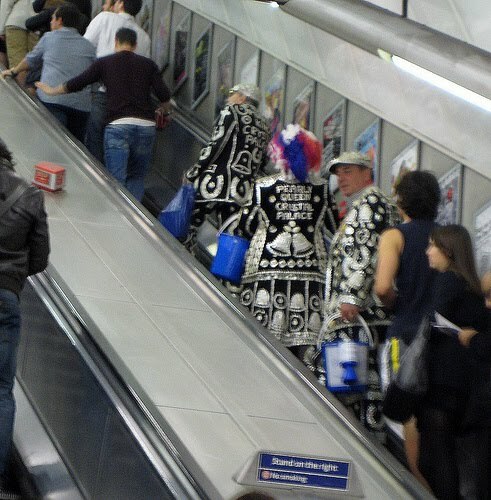 The Pearly Kings and Queens ideal originates in 19th century amongst the Costermonger apple sellers, who wore clothes decorated with pearl buttons, and were famous their charitable spirit. However, it wasn't formalised until 1875, when Henry Croft, an orphan street sweeper, decided to adopt the clothes of the Costermongers and collect money for his former orphanage. He was so successful that other organisations asked him to collect and the celebrated working class charitable idea properly emerged, and in 1911 an organised pearly society was formed. Today, despite disagreements between the Original London Pearly Kings and Queens Association, the rival London Pearly Kings and Queens Society, and the Pearly Guild, the tradition is strong and this afternoon the former association will meet at St-Martin-in-the-Fields for their harvest festival, and to collect money for charity. 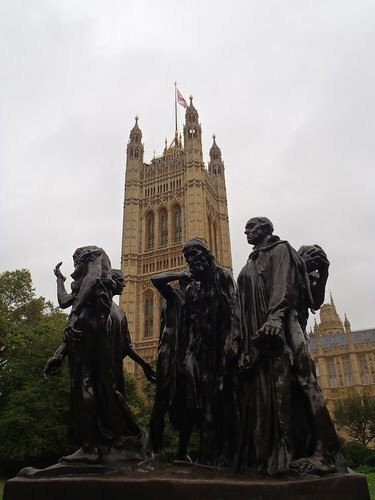 One of six casts of the original monument to the Burghers of Calais in Calais itself, the statue standing in Victoria Tower Gardens, under the shadow of the Victoria Tower of the Houses of Parliament, was cast 1908. It tells the story of a year-long siege of Calais in 1347, during the Hundred Years' War. When the city was no longer able to hold out against the English, they were parley for surrender, and Edward offered to spare the people of the city if six of its top leaders, the Burghers, would surrender themselves to him. Six of the burghers stepped forward, including Eustace de St. Pierre, John Daire, James Wisant and Peter Wisant, and two others, in the manner that Edward had demanded, almost naked, wearing nooses around their necks, and carrying the keys to the city and castle. It was only thanks to the pleas of Edward's pregnant Queen, Philippa, that their lives were spared and she removed their nooses, gave them fresh clothes and dinner, and handed them money before having them escorted out of the camp. Rodin's 1889 sculpture remembers this, and under French law, twelve casts of the piece were permitted after Rodin’s death. The one which stands today in Victoria Gardens is one of them. The rolling programme of art on the fourth plinth in Trafalgar Square is often a source of controversy and debate, and at the 2010 Shortlist Exhibition, in Foyer at St Martin-in-the-Field, examines possibilities for a new artwork for the Fourth Plinth, to be displayed during the period covering the 2012 Olympics. The possible plinth projects include a giant blue cockerel, an integrated cash machine and pipe organ, and an oversized Battenberg cake made of bricks, so they will inevitably foster the usual "But Is It Art?" discussions. This free exhibition also provides cards for visitors to vote and comment on their favourite. For what it's worth, your philistine author went for the cash machine, as there are never enough around when you need one.